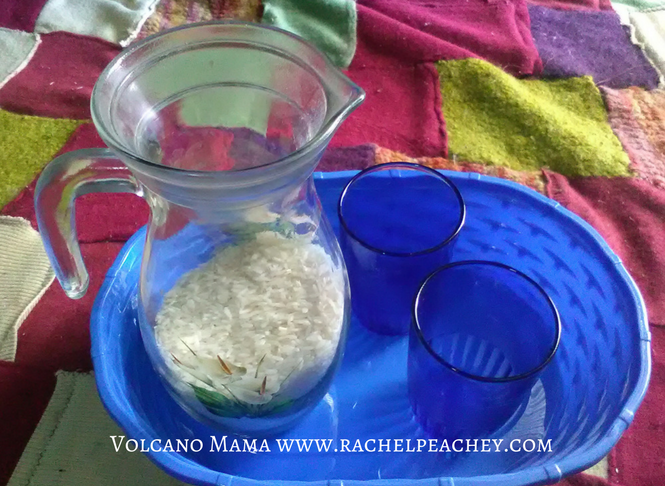 We are in week two of Montessori Homeschooling! It’s the beginning of what will surely be an amazing journey. As I’m just getting started, all of the preparation is fresh in my mind. 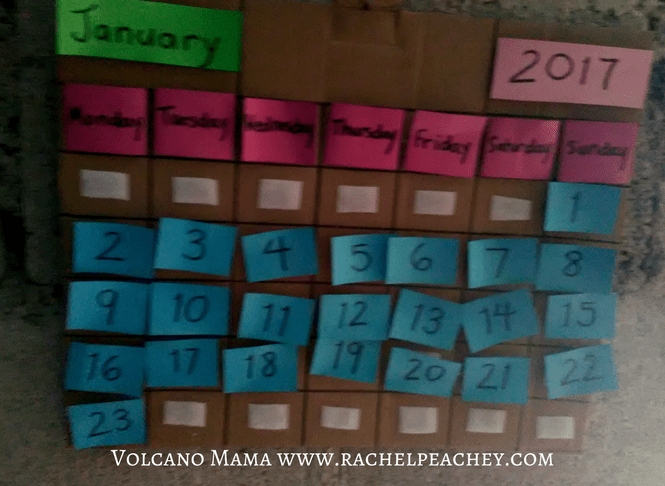 I taught for several years in a primary Montessori classroom and still found it hard to put together the materials I wanted to use to start homeschooling with Peanut (age 4 – born in January)! So, I decided to put together a series about how to teach your child at home, with a focus on how to start Montessori homeschooling, in hopes to help others as they begin. I’m a member of a few Montessori groups on facebook, and it seems common for people to worry about which materials to purchase or make, how to set up the classroom and what to start with. It makes sense. After all, these seem to be the main tools for learning. I, like many homeschoolers, started by thinking about what to use in our classroom space and it seemed like I needed all of the Primary Montessori materials at once. I wanted the pink tower, brown stair, sandpaper letters, spindle boxes, geography puzzles, zoology puzzles and much, much more! Quickly, I realized that this wish list wouldn’t be possible financially or practically (we live in Guatemala…no online shopping here!). But, I also started to realize that it’s actually not necessary either. 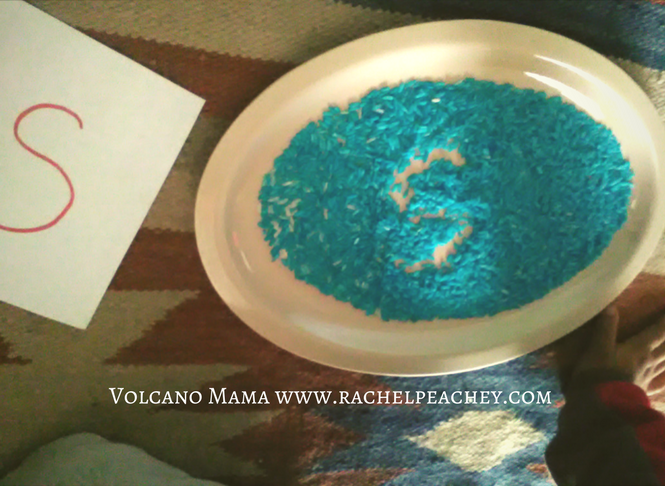 Before I get into what I decided to include in our homeschooling beginnings, I want to say that as a Montessori teacher I LOVE and see value in all Montessori materials. I took a less traditional approach when putting our classroom together because I believe it’s more important to follow the philosophy than it is to provide all of the materials. One of the philosophy’s most important principles is that teachers and guides must follow the child. Rather than deciding what it is that children should learn, adults, rather, should notice what interests the child has and help them discover knowledge and master skills related to this interest. This requires very careful observation. The good news is that parents are great at this! We know what our children’s favorite foods are, we know before they do that they’re tired and we can predict their behavior so accurately it’s uncanny. How to transfer this to starting homeschooling? Simple. Think about your child’s greatest interests, and incorporate them into your plan. When I was deciding what to include for our first few weeks of class, I knew immediately that snakes, reptiles, and nature had to be involved. Peanut LOVES snakes and is very curious about all animals. Learning about this would definitely be very popular. He’s also been asking a lot about where we live, where grandma and grandpa live, why the sun comes up and down, etc. So, I knew I had to include some geography. Peanut also enjoys reading and has shown some interest in learning letters. Montessori also believed that the environment of learning should be tantalizing. Not overstimulating – but enticing. This means things should be laid out simply and in an orderly fashion. The materials should be the most exciting things in the room, drawing the child’s attention to them. This also means that the environment is prepared with learning materials for all areas of study, providing an opportunity for the child to become interested in this area, even if it isn’t one of their primary interests. For us, these “secondary interest” areas are practical life and math. Peanut participates in practical life activities in our home. He helps with washing dishes, clothes, sweeping, etc. 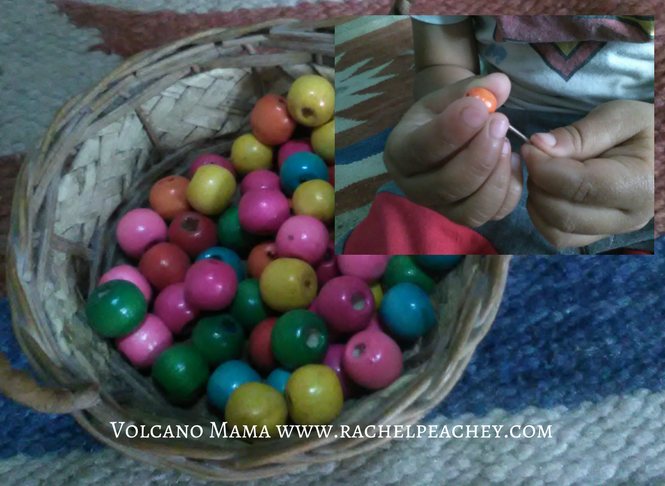 In the classroom, he likes to use a few items I set out to help him continue to develop fine motor control. Math isn’t a primary interest of Peanut’s either. 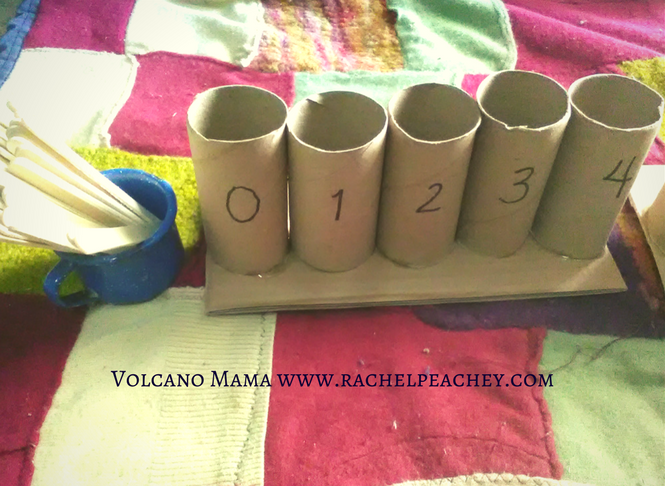 He has chosen to practice a counting activity once – but has since requested to do counting as a part of other activities that aren’t directly related to counting. For example, we made a paper chain snake and he wanted to count the pieces in the chain. Here is a basic outline of what I started with. I don’t have pictures for everything – but it’s mostly here for you to see. Our ABC book and work – see the link for details. I’m currently adding some sound pouches for the sounds he’s most comfortable with. The link has all the details about how I made our sound pouches and how you can use them. Need more inspiration for your language area? Check out the 3rd post in this series about language. Counting sticks – a material I made reminiscent of the spindle boxes. Pictured you can see counting from 0-4. I also have a second set of tubes that show 5-9. Peanut places the correct number of popsicle sticks in each tube. The bead stair – I did it home made with beads and yarn. I switched the traditional colors for 1 and 7 because there weren’t enough white beads in the pack of beads I bought. Need more inspiration for math? Check out post 4 in this series, which is all about math. I made a globe and felt puzzle material for us to use. We’re working on learning the names of the continents. 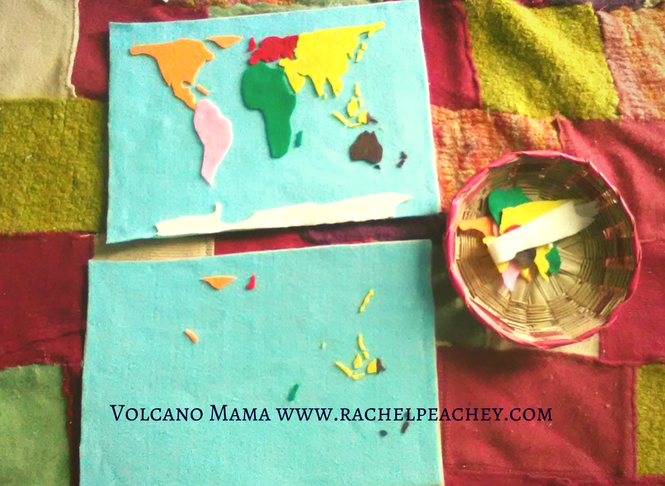 Need more ideas about geography? Check out post 2 in this series about geography. We’re learning about snakes – you can see some of what we’re doing here. Nature Journal – we’re using a blank notebook to draw and write about animals that we see around our home. Our first entry is of a grasshopper! Learn all about how to keep a nature journal in this post. Magnifying glass. We’re using this to look at plants, animals and other interesting things we see around the house. We’re learning about time by using an interactive calendar. Every day Peanut adds the date. I used velcro, cardboard and cardstock to make this. As you can see, it’s a fairly simple collection of materials, but Peanut’s response has been great! He loves it. I truly believe he’s enthusiastic because the materials are relatable for him. They are linked directly to his interests and experiences, making them exciting for him to use. I’m adding more things to his school as we speak because I’m following his lead. This has led me to…more snake stuff (surprise! ), the sound pouches, and a sorting activity for animals that live in the air, water and land. As soon as I let go of my “must have” Montessori list, everything sort of fell into place. And, I’m patiently allowing Peanut to lead the way. Yes, I invite him to presentations – but don’t force anything. I’m a little hurt he has yet to touch the bead stair, but this is only the second week. He’ll be more interested in math at some point. Right now his sensitive periods seem to be language and science. If you’re wondering how to start Montessori homeschooling, I encourage you to let go of your lists and focus on your child. Carefully pick the items to introduce into the environment and adjust as you go. This is essentially what Montessori herself did! Best wishes on your Montessori homeschooling journey! The later posts in this series will show you each material we’re using in detail and describe how you can present it to your child and any extensions that are relevant. That’s great Suzanna! Best of luck with your adventures. Thanks! Glad you enjoyed it. We’re homeschooling for the joy of it, not to meet any requirements. I think Peanut will also go to public school next year, but I hope we keep up with our homeschooling because it will be a great way for him to develop his English (we live in Guatemala so public school will be all Spanish) and continue to explore. Yes! 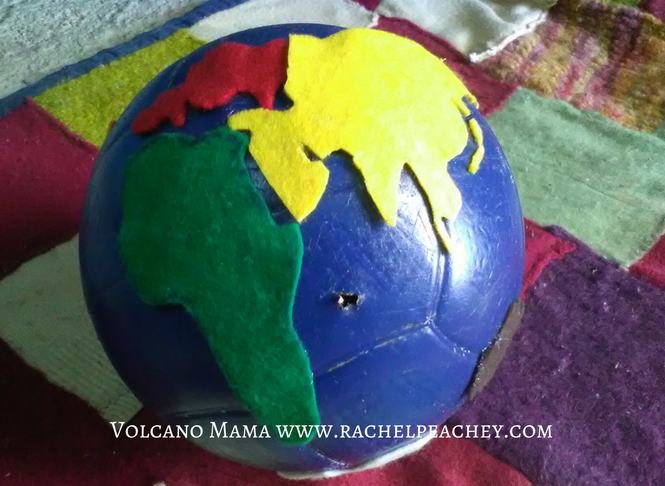 the globe is great…I love the way Montessori uses a different color for each continent – easy identification! Thanks for reading! Thank you for this very informative post! I never have fully explored the Montessori method but know how my friends who have kids in Montessori schools universally love it. It makes all the sense in the world to piggy back on what the child is interested in rather than to try to shove something down their throats that may turn them off from learning altogether. Really appreciate how nicely you explained everything. Thanks for reading! Even if you’re not a trained teacher, you can do a great job because that 1 on 1 time with your kids can do so much. And you can always learn 🙂 Best of luck and thanks for hosting! Glad you find it helpful, and thanks for hosting! Thank you for this great article. 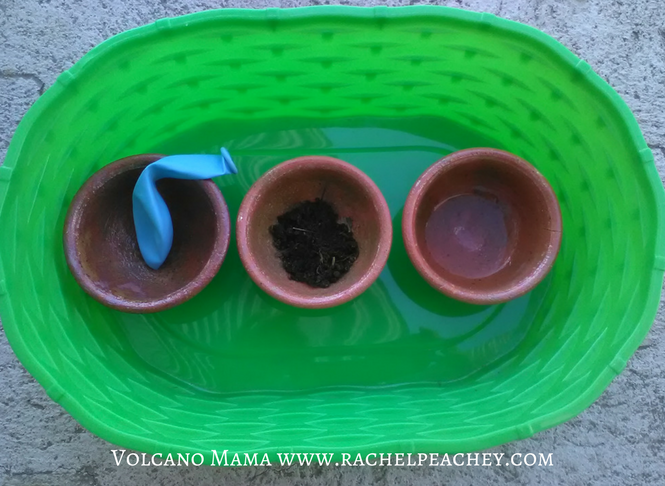 I was wondering how to start Montessori based activities to my toddler (22months). After reading this article, I know what to do first. It is to observe more deeply about my daughter interest. I love this phrase, “Follow the child” so much. Thanks for reading! I hope you are able to pick some great activities for your toddler based on her interests. I feel so excited to start with these ideas! 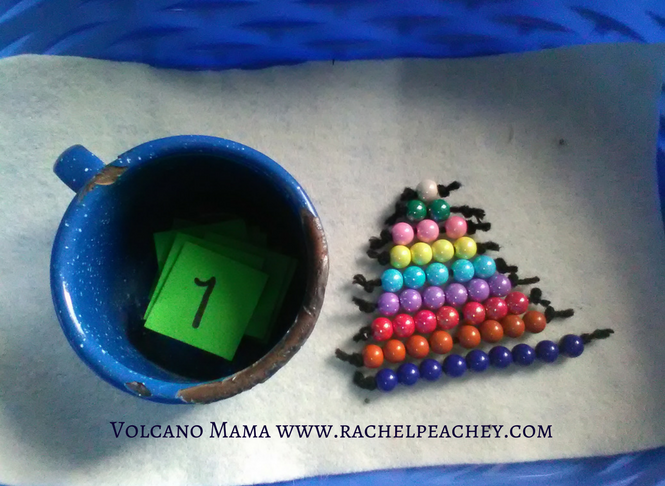 I’m trying to montessori homeschool my 2 year old daughter but I was feeling so confused because it isn’t common in Guatemala to use this system. I’m happy to know that there are others who are already doing it. Yes, you are certainly not alone Claudia! Happy homeschooling!